Benque Viejo del Carmen has been without the service of an ambulance for several months now, reportedly because the vehicle which was donated to the clinic by the embassy of Italy a few years ago, has been confiscated by Guatemalan authorities. News Five has attempted to confirm the story; however, we were unable to get an audience with the mayor of Benque Viejo earlier today. It is reported that an outstanding ministerial debt with an outfit in Melchor de Mencos has resulted in the seizure of the vehicle. Residents of the municipality contend that the loss of much needed services provided by the ambulance has jeopardized the lives of the sick. Following the vicious chopping of Canadian national Steven Reichert on Friday morning, the businessman had to be rushed for medical treatment by a Good Samaritan, a service, he says, should have been done using the vehicle. So now guatemala can just take our ambulance just like that? what Happen GOB? you’re like a lee chiwa wah wid ur tail between your legs! Ok. So we have an outstanding bill across the border, and now they confiscate our Ambulance. Oh and we chop up Canadians. Oh and the Ambulance was donated. Oh and we were driving it out of country when we can’t even get a Belizean doctor to suggest out of country medical treatment to a dying person. ….. Maybe it’s just me. A ministerial debt, that sounds to me that this is a personal debt racked up by someone in government. Was the ambulance used as collateral? if it were not then this is an illegal seizure, especially if it is for a personal debt not incurred by the hospital or the government. Every day I keep thinking it just cannot get any worse in Belize, guess what I get another surprise, bigger than the day before. Yes many questions should be asked about this one; I hear the ambulance was used more to transport contraband deliveries, than sick people because they had used all the fuel? and who had the authority to allow our ambulance to leave Belize to pay a minister’s bad debt? Who made this deal? Someone should be charged for theft of public property? Why didn’t the Mayor or Minister want to talk to reporters when they went to Benque that day? I guess it must be true? And this to isn’t corruption? We have retards in elected office. Let me get this straight. 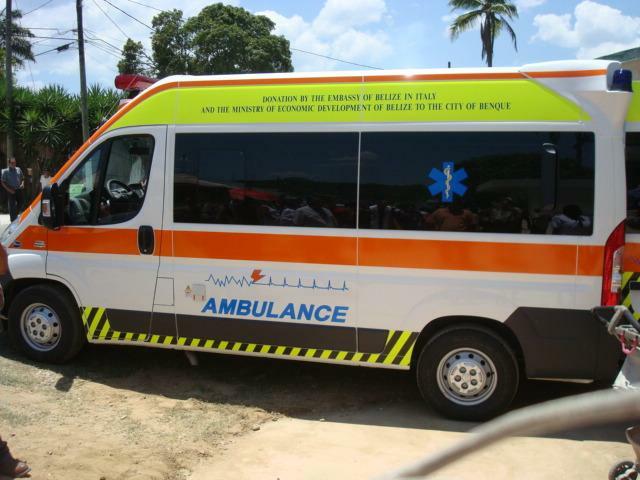 the ambulance is donated to the people of Benque Viejo, but the minister owes a personal debt and he loses the ambulance to Guatemala. What was it a gambling debt? Shouldn t we start enforcing the law of fraud and misappropration of funds and theft by conversion. Do we have to get a petition together to criminally charge our Minister with this nonsense. The explanation of the car being in for service is BS as the Fiat dealer is right here in Belize. I hear Benques fire truck is broken, and the garbage truck is for sale also. Pretty soon there wont be any service vehicles left. Why cant we put Minister Erwin C house up for sale. Why dont we use his New land cruiser SUV for the ambulance in the mean time until he gets Benques back. Where is our cowardly Minister hiding? We have a better chance of seeing the Loch Ness monster than this shifty eyed snake coming out of his hideout. Oh wait I know how to get him out, lets tell him, there is some new American investors in town that he can fleece. Whats next tear up the roads in Benque and sell the asphalt.? OOps oh wait he already did that also. Benque is still all dirt roads and potholes.